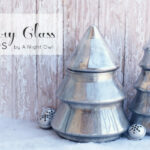 1) This DIY Cloche was made from a $3 cheese dome from Goodwill, a repurposed plate and a dollar store candle stick. 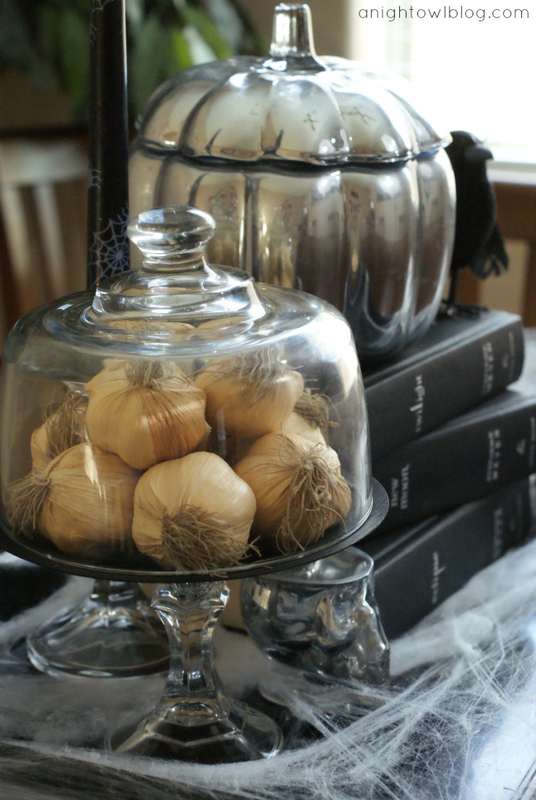 And the garlic to keep those vampires away were cut off a string of fake garlic also found at Goodwill for just $1. 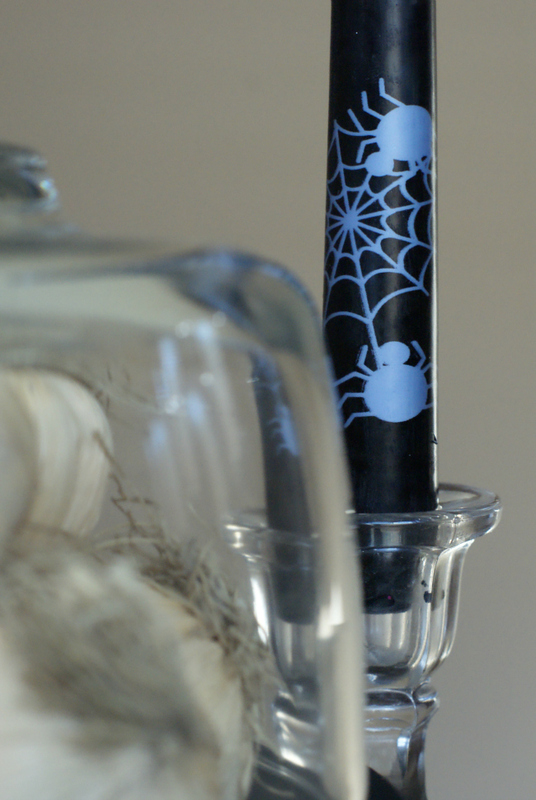 2) The spider candlestick is from Hobby Lobby, at 40% off seasonal items this candle was just $1! And the candlestick I picked up for just $2 at Goodwill. 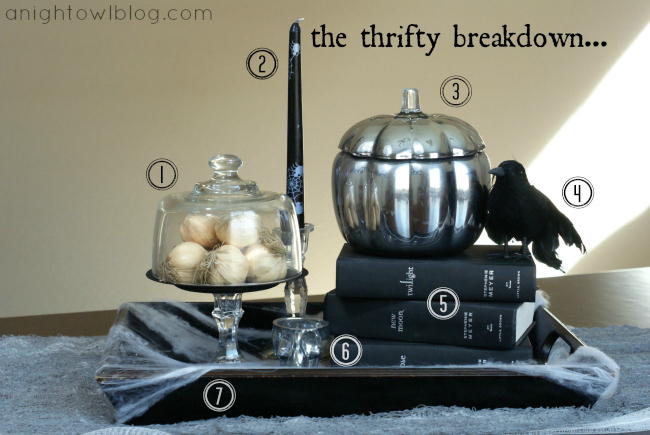 3) Our very own Knock-Off Pottery Barn Mercury Pumpkin that we shared with you last week. Project cost, around $8! 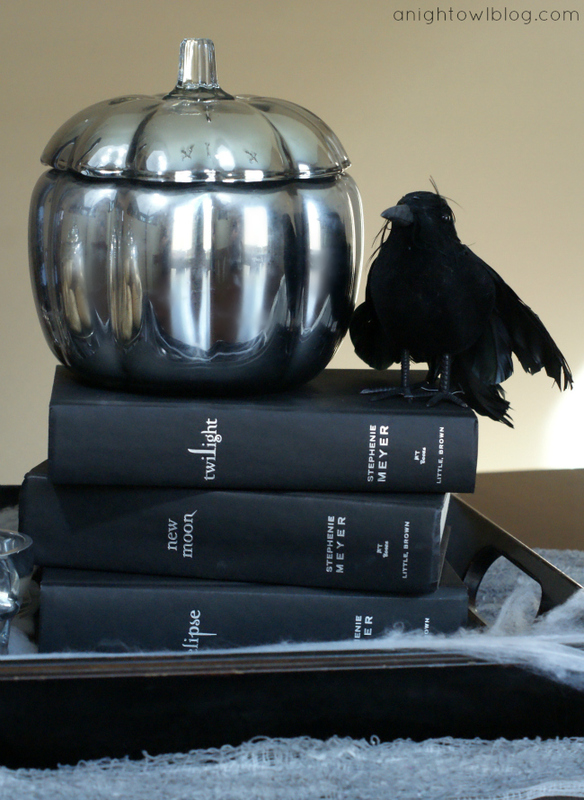 4) Perfectly spooky black bird from the dollar store. 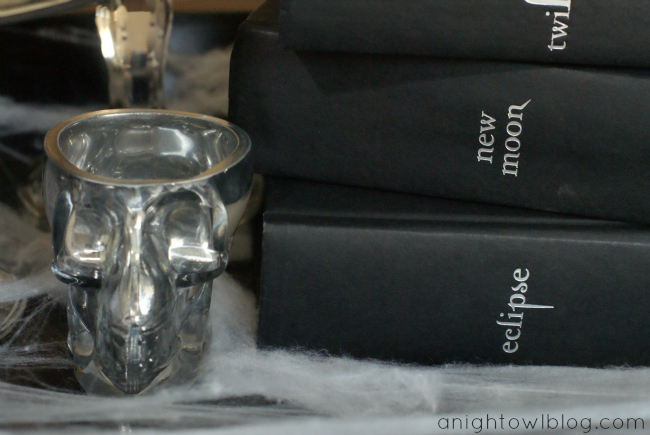 5) Twilight books: you got it, repurposed from my personal library! 6) Little skull I picked up at Ross for just $3 for 2, sprayed with a little Krylon Looking Glass spray paint as well for that mercury effect. 7) And lastly our trusty large tray was just $3 from Goodwill. What do you think? 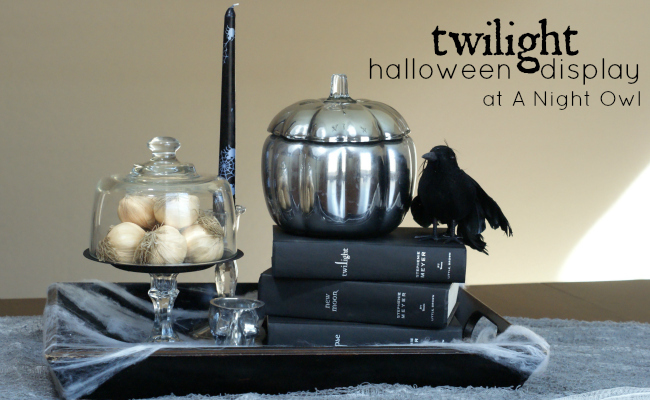 Would you create a Twilight Halloween Display in your home? My husband even complimented the display, now THAT is something! I’d love to hear what you’re doing this Halloween! Love your display. 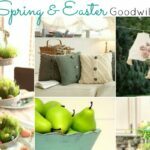 Great finds & mercury paint is so pretty I love it & can’t wait to try some myself. OH MY GOSH!! I love it!! I lost the covers to my Twilight books a long time ago, too. They just look so much more elegant in all black!! I love your display! So great!! Love this! So perfect for my taste in Halloween decor! OMG…so stinkin clever!! inspiring!! love it!! But WHY would I want to keep those handsome vampires away?! 🙂 Very cute! GAH, I LOVE it…especially the garlic bit, a great little addition! Bring on Twilight!!! Fantastic! I love it! 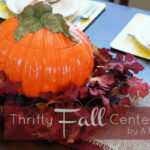 I love all the great things you find from the thrift store to re-purpose! YEY!! What a fab display Kimberly!!! I love the touch of the bird! I love this!!!! 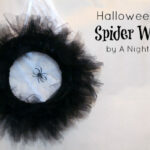 Love the spider webbed candle stick and omg!!! 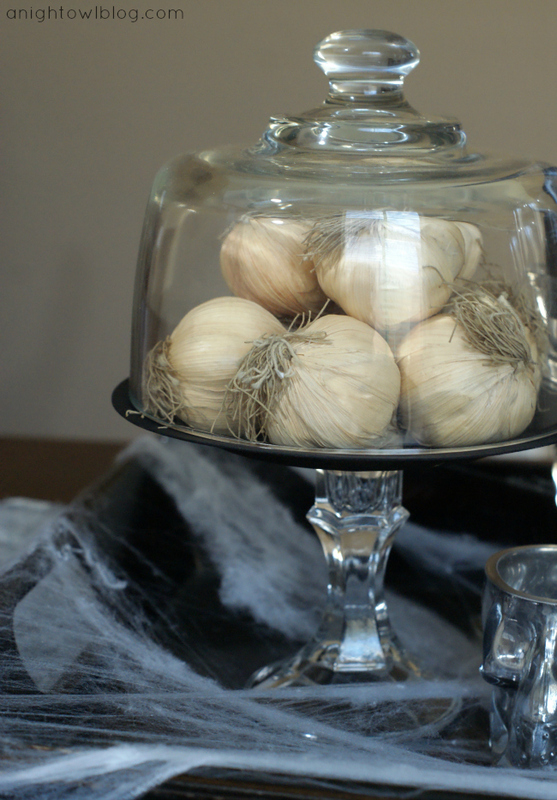 what a great idea with your garlic inside of the cloche!!! genius! you make me wanna visit the goodwill NOW! This looks so great, fun yet classy! The mercury pumpkin is by far my favorite. Now I need to go click over and find how how you made it! !